I’m feeling proud of myself. I told myself I was going to paint today and I did! Picking up the paint brush felt strange but familiar. Well, familiar but awkward. It was at that point that I realized I was going to have some major “growing” pains as I try to relearn all that I had forgotten. It’s going to take some time to get use to the brush again. I almost wish I didn’t decide to take on such a huge project for my “first time back”. A “fine arts” piece for my home; painted on a very nice and “expensive” canvas. I am hoping for nothing but the best but that odds are really against me. 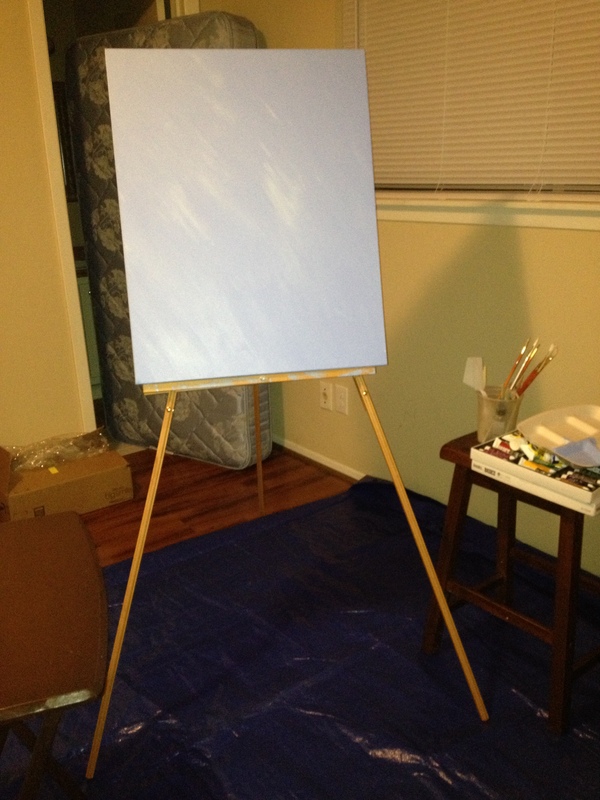 I was never really a painter to begin with, so this isn’t something that will come naturally “back” to me. It’s kind of crazy how all these doubts ran through my mind as I started laying down the first layer of paint. It’ such a simple process to paint the background, yet I kept feeling inadequate. I kept telling myself that I wouldn’t be able to do this or finish it. I kept imagining how hideous the painting was going to turn out and how ashamed I will be of it. It was at this point that I realized the hardest part to any project is starting it. I eventually drowned out my conscious with music. I had to put on earphones because it’s the only way I am ever able to lose my surrounding, my environment. For a good 20 minutes, I was in my own world alone and unafraid. It was nice. 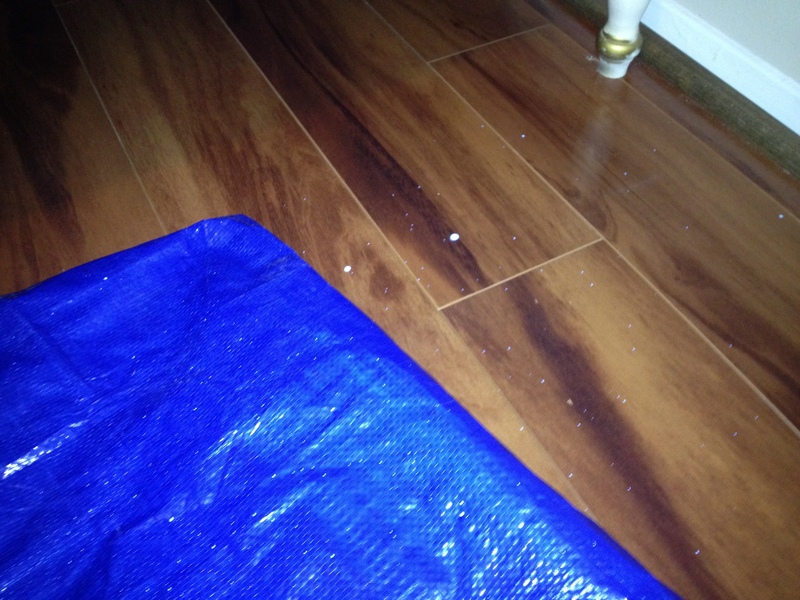 I naively thought I wouldn’t get any paint on the floor, but I did. 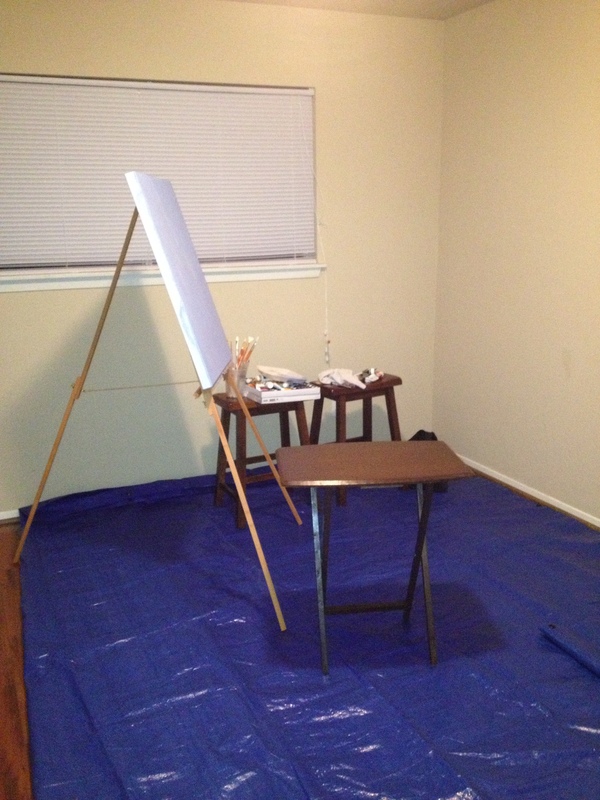 I had to stop painting and grab a tarp from the garage. Even with the tarp laid out, I managed to get paint everywhere… haha looking at the picture, my tarp looks kind of sad and obviously not spread out enough. 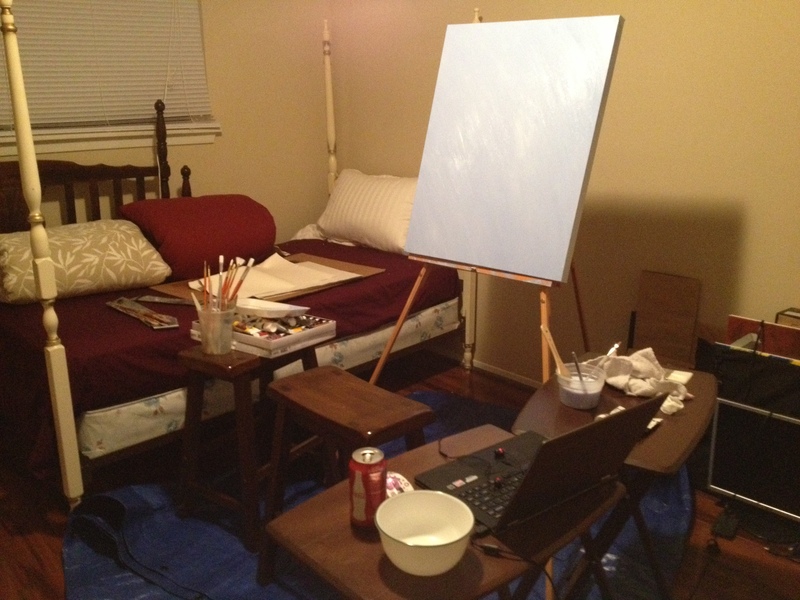 I forgot to take a picture of the bed, but there is paint sprinkled on the sheets, the red blanket, and the white pillow case. I’m painting with acrylic so I know it’s not coming off. Also… I forgot how FAST acrylics dry. I was getting pretty annoyed and frustrated with how fast it dried because it didn’t give me much time to manipulate the paint. I added some water but it messed up the paint’s texture. I’ll probably have to run to the art store and get some slow-drying stuff to mix with my paint. I know, it doesn’t look like I did much of anything, but I knew I wasn’t going to get much done today. I always take a ton of time “setting up”. I’m happy that I was able to get the background layer down. Hopefully I’ll have time tomorrow to add some details, but since I have plans to set up my photography project tomorrow, it’s very unlikely that I’ll get around to working on the painting.